With summer right around the corner, we’ve got sunshine, sprinklers, ice pops, and watermelon on our minds! Those are just some of the things we love about summer around here! 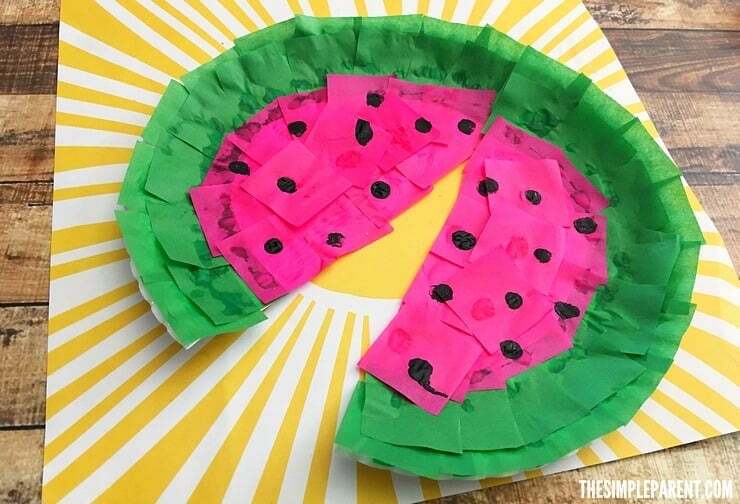 To celebrate we made this cute watermelon craft from a paper plate! Check out how easy it is to make! Carrigan’s favorite fruit is definitely watermelon and she recently got a new shirt with little watermelon slices on it. She loves it so, so I knew this watermelon craft would be a hit with her. Plus, I love paper plate crafts so I’m always happy to put together a new one! We read a book we have about watermelons first and then had a good time making our own slices! I included a few links to some of our favorite children’s books about watermelon at the end pf the post too! We’ve included some affiliate links as well and thank you for supporting us! 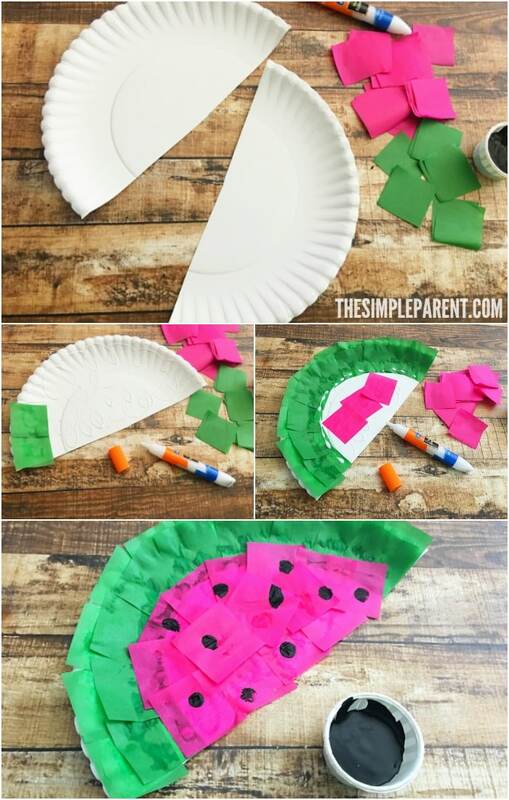 Cut the paper plate in half. 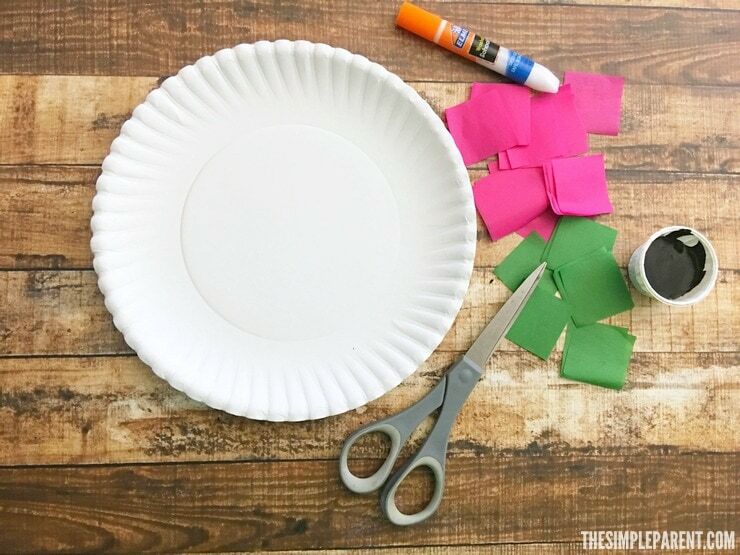 Spread a layer of Elmer’s glue onto the paper plate. Start sticking on a double layer of green tissue paper around the top curve. Then stick pink tissue paper squares onto the inside of the paper plate. Dip a finger into the black paint and press onto the pink part of the watermelon to look like seeds. Both kids made a slice of watermelon and now we’re excited to pick out a watermelon at the store next time we visit. 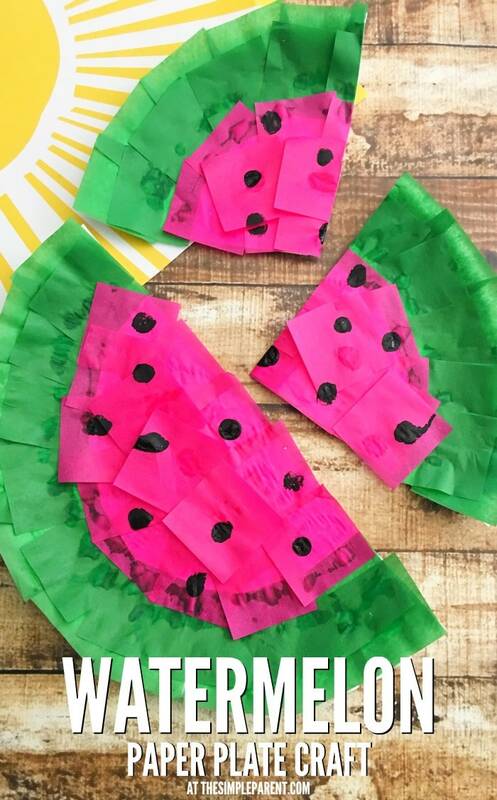 If you’re looking for a book to share with your kids to go along with this watermelon craft, here are a few that we enjoy! « Kids Sprinkler Games and Activities to Keep Them Cool!